Britten’s operas remain popular in Germany, and the composer’s centenary year in 2013 seems to have spurred a renewed interest. 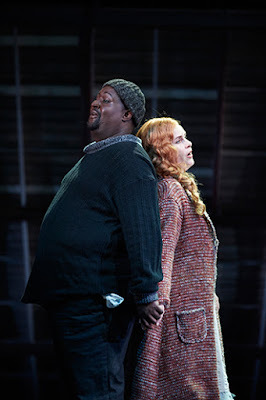 In the space of a week, I managed to catch two of the half-dozen different productions of Peter Grimes on offer in the country during the 2014–15 season. 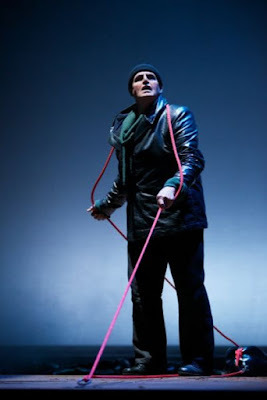 It offered an interested ‘compare and contrast’ exercise, but also gave that rare experience of hearing a work rooted in one’s own native language and culture – and over the years I must have seen more live performances of this opera than any other – transplanted into a ‘foreign’ milieu. Both companies, in Koblenz and in Ulm, to their credit performed the work in English (original-language performance is virtually the norm in Germany these days), but the success of that English proved surprisingly variable. With several Anglophone members in its cast, Koblenz fared markedly better than Ulm, which could have benefited from a language coach who could have at least ironed out inconsistencies of pronunciation of characters’ names and occasional drifts into American-English (these people inhabited a town called The Burrow; Grrrrrrimes sometimes gained an inauthentic rolled ‘r’; and according to Ellen Orford, ‘we shall be vizz him’). On the other hand, it’s probably something that native speakers of German, French or Italian have to put up with on a daily basis as their repertoire is subjected to multi-national casts. The pronunciation divide was not the only element that set these productions apart: Koblenz offered the finer musical performance, but Ulm had arguably the more coherent staging. The one area where the Koblenzers left something to be desired was the placing of the orchestra right back behind the stage. Theater Koblenz is a tiny, rare 18th-century survivor, a compact, 460-seater horseshoe auditorium tacked on to a modern stage rebuild. As such, its pit is too small for a full symphony orchestra, so needs must. 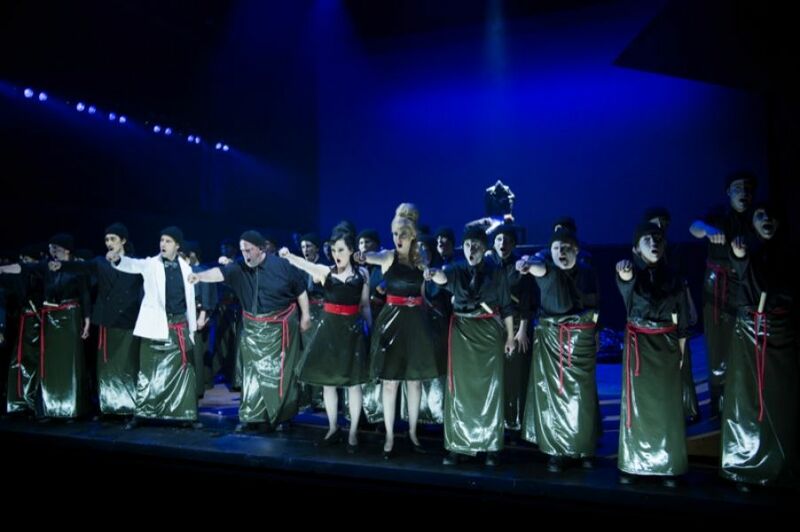 It was just a shame, therefore, that Bodo Demelius’s set – a modular platform-come-ceiling of girders and decking – had to take up the full depth of the stage, when so much more use could have been made of the covered-over pit as a performing area and allowed the players to sit closer to the audience. As such, the alert playing of the Rhenish Philharmonic State Orchestra was a little too distant and muted, and in Act III it gave the perverse experience of hearing an off-stage main orchestra coupled with onstage dance musicians whose music should really drift in and out of focus from behind the scenes. 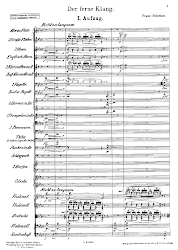 Enrico Delamboye’s conducting was generally apposite, though the way he and the director spun out the Prologue for laughs lost a lot of its essential swift tautness of character-introduction. 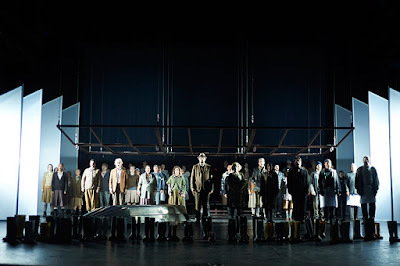 The Koblenz chorus was simply magnificent, both in its superbly clear diction and its power – the gathering of the plank-wielding mob at the very front of the stage, just yards from my second-row seat, was perhaps the most terrifying this Act III scene has ever been in my experience. As Grimes, the Texan tenor Ray M. Wade Jr – much admired as the Emperor in last season’s Die Frau ohne Schatten in Kassel – gave a profound interpretation that revealed the character’s vulnerability, with lyrical, warm-hearted singing and a real feeling for the words (no American drawl here!). Aurea Marston’s Ellen Orford marked this Swiss-born former mezzo’s debut as a soprano and offered firm tone and a sense of line, though her patchy English diction sent me scrabbling for the German surtitles to remind me of the text I thought I knew so well. Mark Morouse’s Balstrode was warmly sympathetic in voice and interpretation and US-born, Guildhall-trained mezzo Melanie Lang was a fruity, cut-glass-English Mrs Sedley. I also enjoyed Junho Lee’s youthfully lyrical Rector and Anne Catherine Wagner’s resonantly sung Auntie, once she had got over her initial squalliness. I was less taken with Markus Dietze’s production, however. It was unclear what he was trying to tell us – that the impoverishment of this community was what led it to scapegoat one of its number? This was at least a clue given by Georg Lendorff’s often enigmatic video images that during the interludes were projected on to the gauze hiding the orchestra, the one during the Passacaglia showing miserable workers locked out of shipyard – otherwise they were largely a bizarre succession of ‘seaside’ images. The scene in The Boar was an impromptu gathering, with Auntie serving bottles of beer from an old shopping trolley; and I wasn’t sure what to make of the final scene of the whole cast lining up their wellington boots in tribute to the dead apprentice. Characterisation was often over-egged, from Mrs Sedley’s neurotic tic and Auntie’s persistent cigar-smoking to Swallow’s rapacious flirtations, though Wade’s Grimes saved the day with a touching portrayal of a man with naive hopes and dreams and who doesn’t realise his own strength in his treatment of the apprentice. Thus was Grimes on the Rhine. Over at Theater Ulm on the Danube, meanwhile, director Matthias Kaiser conjured up a more focused, Expressionist presentation of the drama, with the chorus as a uniform mass in matching oilskins and with half-white-half-brown faces. Marianne Hollenstein’s set was of a rotting hulk of a ship in a breaker’s yard and much use was made of stage lifts to suggest a highly unstable ground for the people’s existence. But although the effect was often visually striking, there seemed to be too little understanding of the verismatic exactitude of many of the stage directions: how can Mrs Sedley ‘have the evidence’ if she’s not there to witness Ellen discovering the boy’s bruise? Why does Balstrode enter Grimes’s hut through the cliff door from which the boy has just fallen (a theoretically effective staging muffed by an unwilling rope)? And, by the by, what were those gently meandering fish projected on to the front cloth during each of the interludes supposed to represent? Perplexing compared to the large, dramatically colourful canvasses Hollenstein had painted to represent each of the six interludes that stood on display in the foyer. Hans-Günther Dotzauer gave a very different Grimes compared with Wade in Koblenz. Possessor of a more authentically Pears-like timbre than the American, this German tenor’s gruff, bullish characterisation didn’t grow enough through the drama, though, as if he were hemmed in by his costume of woolly hat and leather jacket and his fate were sealed from the start. Ukrainian soprano Oxana Arkaeva, making her farewell performance in the Ulm ensemble, was somewhat miscast, her Slavic swoopiness and tendency to yell at phrases a long way from the usual demure English schoolmistress, though her lyrical moments had admirable tenderness. Nor was her engagement with her character convincing in her reaction to events around her, smiling in all the wrong places. Tomasz Kałuzny was a pallid Balstrode, who didn’t really command his scenes as a former captain should. I Chiao Shih’s Mrs Sedley was vocally indisposed and the singer mimed (ie overacted) her part while Judith Christ (who coincidentally had been singing the role earlier in Koblenz’s run) sang resonantly from the side of the stage. The Ulm chorus, indistinct in diction and wayward in English, was no patch on Koblenz. Nor did the Ulm Philharmonic display enough ease with the idiom: Daniel Montané’s conducting was inflexible and the dry acoustic of the theatre gave a perfunctory air to the broad emotional sweep of the music. Hi Matthew: long, long time no hear... thank you for my two Musical Times jobs in the 1980s! I apologise for not having been very good at reviewing... unlike your very good self! I am so happy to hear you've had to listen to 'more live performances of this opera than any other': you will recall my love of BB, I hope. I owe you my first ever listen to Paul Bunyan, as I recall, courtesy of Felix. Have admired your work from afar for many a long year. Just wanted to mention it.